10:30 am; first tour is at 11 am. Tours operate from May through September. Advance reservations recommended. On-site ticket sales are credit card only. Take Lake Shore Drive (US 41) north. Exit to the right on North Sheridan Road. Follow Sheridan Road for approximately 2.5 miles. The Bach House is located on the east (right) side of Sheridan Road. Parking is available in the structure at 7331 N Sheridan (one block south of the Bach House). Take the north bound (Howard) Red Line train to the Jarvis stop. Walk 3 blocks east on Jarvis to Sheridan Road. The Bach House is located on the east side of Sheridan Road just north of Jarvis. The Bach House has limited access to persons with mobility restrictions. “Will Call” Ticket Holders and “eTicket” Holders - Check in at the front sidewalk gate of the Bach House no later than 15 minutes prior to your specified tour or event time. 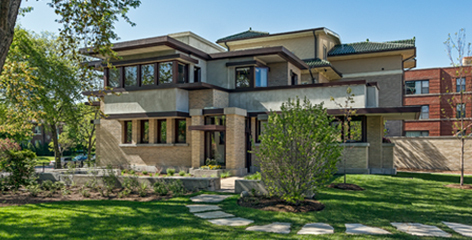 The Bach House is Chicago's only Wright residence open for vacation rentals and private events. Enjoy a one-of-a-kind experience, whether for business or pleasure. 773.764.9851.